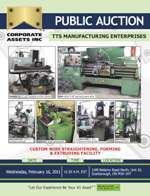 Corporate Assets Inc. | TTS Manufacturing Enterprises - Corporate Assets Inc. FEATURING: Wire coating extrusion line, (3) TAC, CLIP and SPRING lines; AGIECUT 15/35 wirecut EDM; AFM 18/26 gap bed engine lathe; WAFIOS SLF-4 wire former; BRIDGEPORT mill; OKAMOTO 8” X 20” hydraulic surface grinder; LIAN FENG LF-612 manual surface grinder; ARCHDALE 4' radial arm drill; K&K roll in type vertical bandsaw; DOMINION H frame hydraulic shop press; HOBBS 15HP extruder; BROWN BOGGS 30 ton press, BROWN BOGGS 15L OBI press; BLOW 30 ton OBI press; 84” X 84” X 53” deep gas fired curing oven with 800º F max. temp., 15HP air compressor; CATERPILLAR 5000 lbs. LPG forklift, also die carts, hoist, wire baskets, uncoilers, welders, vises, cabinets, tables, office furniture and more.